Dinner Little Beach Boat House Spice Temple The Malaya Waterfront Restaurant Departure at 9.40 p.m.
Sydney and its surrounding area have so much to offer. If you’re planning a few days there, then you need to make sure you pack as much as you can. What makes Sydney so amazing? First of all the Sydney Harbour is one of the most beautiful harbour in the world – one gets to take in the beautiful view of Harbour Bridge, Sydney Opera House and other iconic architectures all at once. Being a metropolitan city, the food choices are as diverse as the people here. We never had a bad coffee here, and every meal was amazing. You might think that the grass is always greener on the other side, but the sky is indeed so much bluer in Sydney. 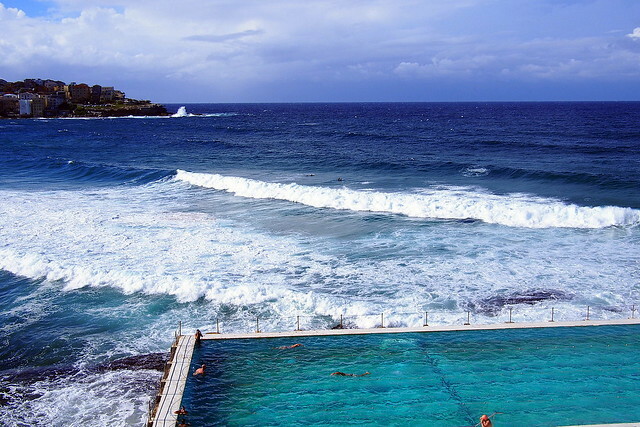 Not to mention, I can just hangout for one whole day at its amazing beaches such as the Bondi, the Bronte and the Tamarama (there are at least 100 beaches in Sydney). 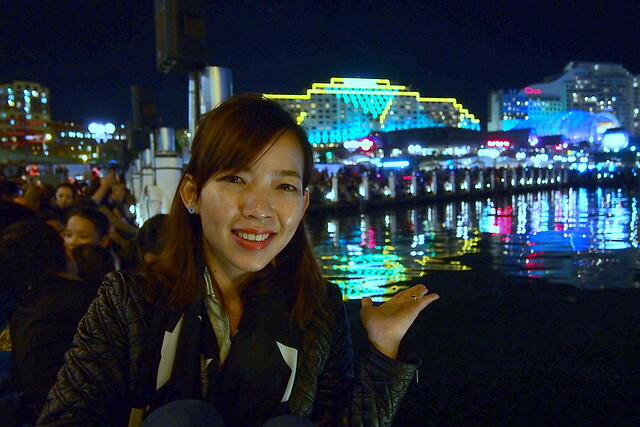 Of course, Vivid Sydney is a great reason to visit Sydney. This free event runs from end May until June 9 and bathes the city in colourful lights from 50 installations and projections across six sites around harbour foreshore, from Darling Harbour to Walsh Bay, North Sydney, The Rocks and Circular Quay, as well as lighting up Martin Place for the first time. The festival of lights, music and ideas never cease to surprise every year. One can choose to go on a dinner cruise to take in the spectacular lights or walk through the light sculptures just like us. I would like to extend my sincerest thanks to Tourism Australia and Tourism New South Wales for this amazing opportunity to see the beautiful region of NSW. It makes me wonder why we have never been to Sydney prior to this. If time and budget permits, we will definitely be back! 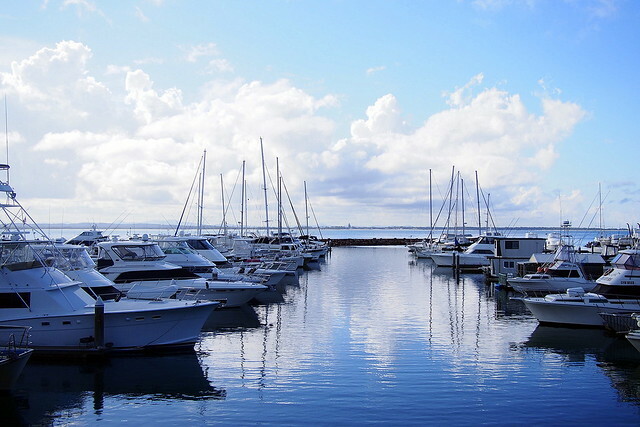 From Sydney International Airport, we took a 2.5 hours road trip to Port Stephens. 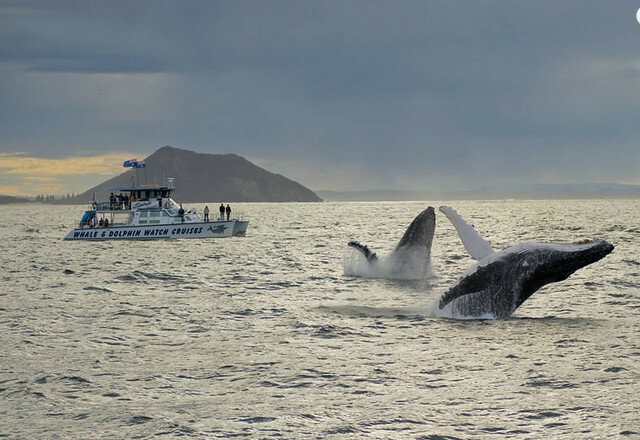 It is an idyllic beach getaway destination that is popular for its whale watching (seasonal) and dolphin watching cruises. 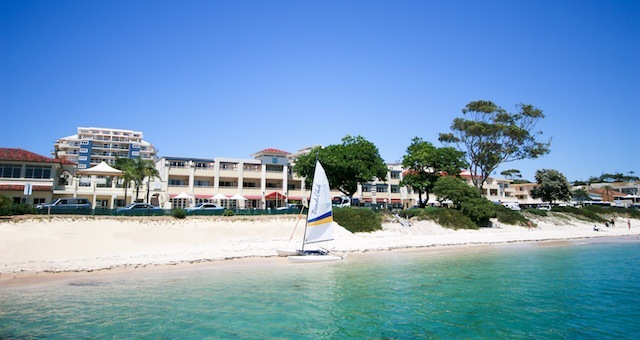 With its pristine beaches and calm waters; water activities such as diving, snorkelling, kayaking, swimming, surfing, sailing or taking a relaxing ferry ride is also very common here. 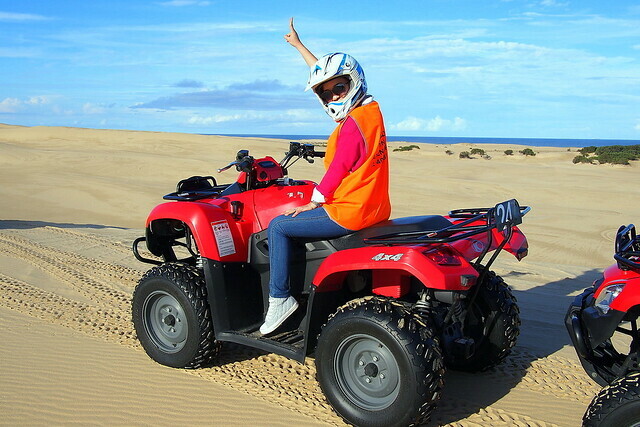 Other leisure pursuits include quad-biking, 4WD touring and horse-riding through the bush or on the sands. 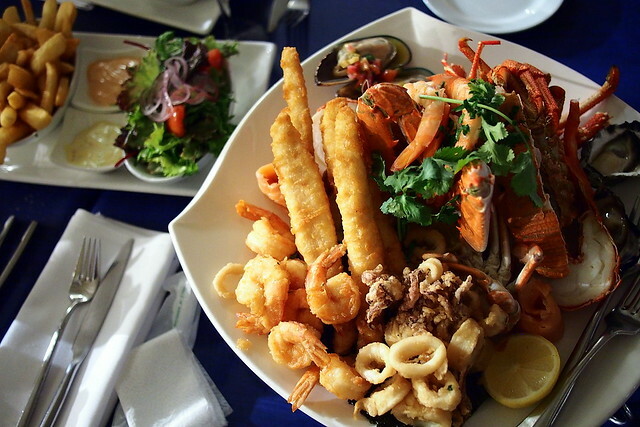 When visiting Port Stephens, seafood is a must as most restaurants seem to include freshly caught seafood onto their menus. 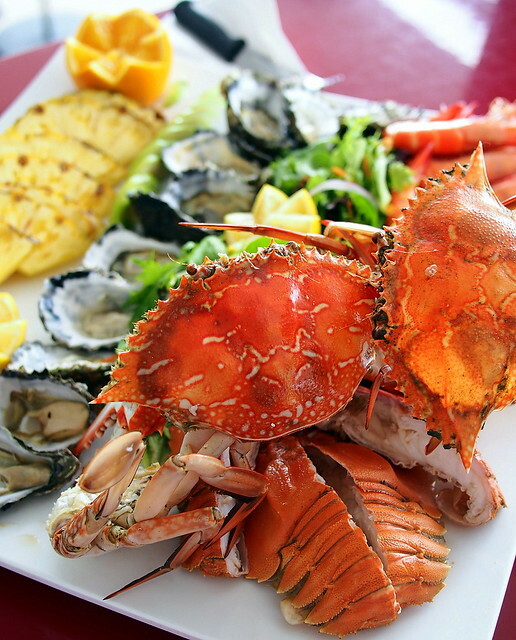 Our seafood platter of crabs, oysters, moreton bay bugs, mussels and shrimps were really fresh and delicious! The seafood platter makes great fuel for our quad biking adventures! With the help of local experts who know every nooks and crannies of the sand dunes, we rode from the bush to the beach and up the huge 40 metre-high Worimi Sand Dunes and around coastal wilderness. These guys know their way around the sand dunes, without them we would have gotten lost. 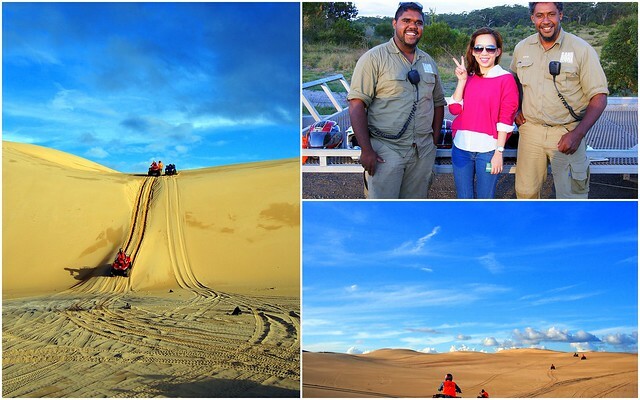 It was a great fun experience, especially when we glide down those sand slopes. 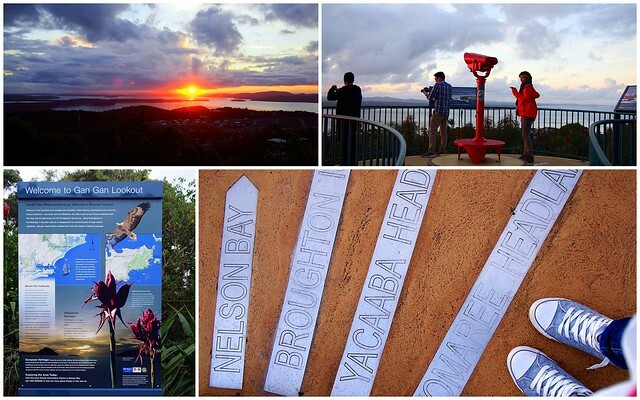 We drove up to Gan Gan Hill Lookout Point to enjoy some spectacular sun set view. From here, we had a great 360 degrees view of Port Stephens. Rated as #2 best restaurant in Nelson Bay, Little Beach Boat House did not disappoint. The food was just brilliant and the staffs have been very helpful and friendly. Remember to say hi to the sweet looking twin sisters when you are here! We were having our lunch at a beautiful cafe with the most glorious view overlooking the beach and the sand dunes. It is a casual place to kick back and enjoy some good food and a great selection of beer on tap. P.S. I LOVE YOU! 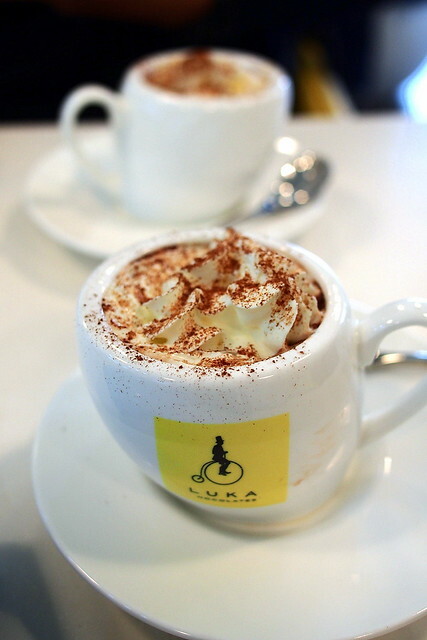 It is time for us to leave Port Stephens and along they way, we made a pit stop at the Luka Chocolate Factory. Luka’s award winning, artisan chocolates are completely hand-made using the best cocoa beans. We arrived at the Harbour Rocks Hotel soon after. 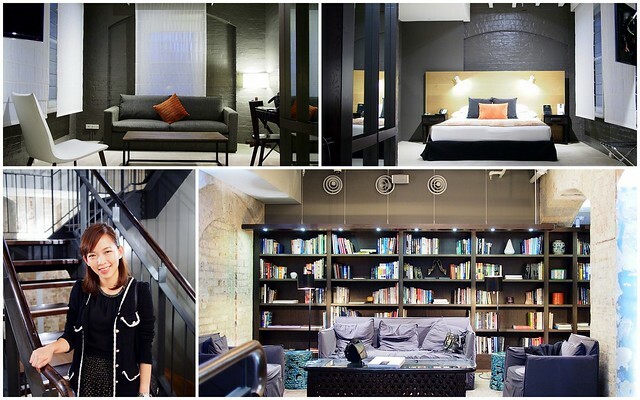 This beautiful, stylish hotel is located in the Rocks, Sydney’s historic precinct and landing of the country’s first English settlers. Every corners of the hotel is so instagram worthy with a lot of wood, steel, brick and leather elements here and there. We were very lucky to secure a table at Australian celebrity chef, Neil Perry’s establishment. Spice Temple is set on the basement of an art deco building. 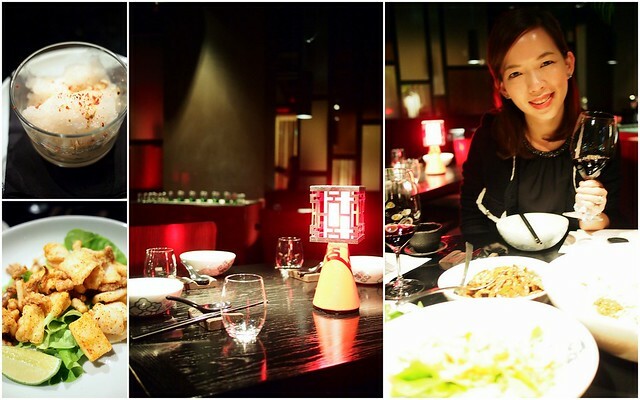 The menu features fusion Chinese food with a good selection of wine list and funky cocktails. Musical is totally my thing. 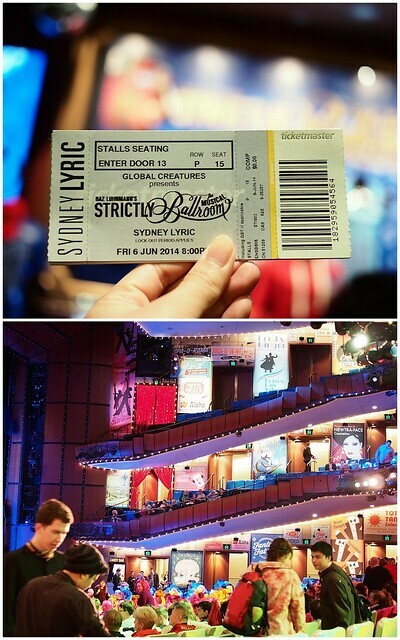 Fortunately, we managed to secure Strictly Ballroom tickets last minute. Just like the original classic 1992 film, the show was great and we thoroughly enjoyed every minute of it . Pirrama Road, Pyrmont, Sydney 2009. Eveleigh Farmer’s Market is my favorite part of the whole trip! 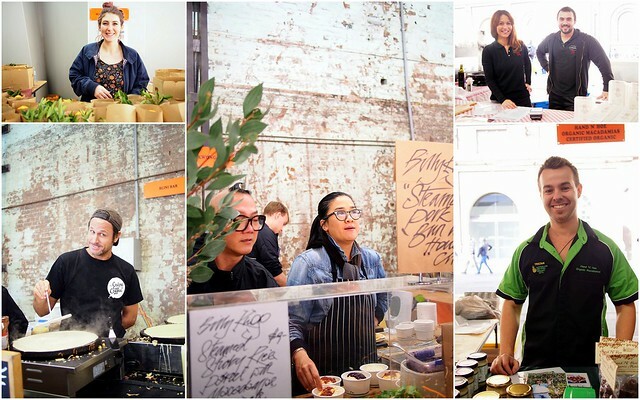 It is an award-winning authentic Farmers’ Market held every Saturday from 8am to 1pm in the heart of Sydney City. I like how the local farmers and artisan food producers pack their trucks with their fresh, seasonal and homemade produce they grow, rear or make. I got to meet and talk to many of the vendors. All of them have different stories to tell and I really love their passion in doing what they love. Oh, Kylie Kwang is also cooking at the market. Her Chinese cuisine stall is always spotted with a snaking queue. 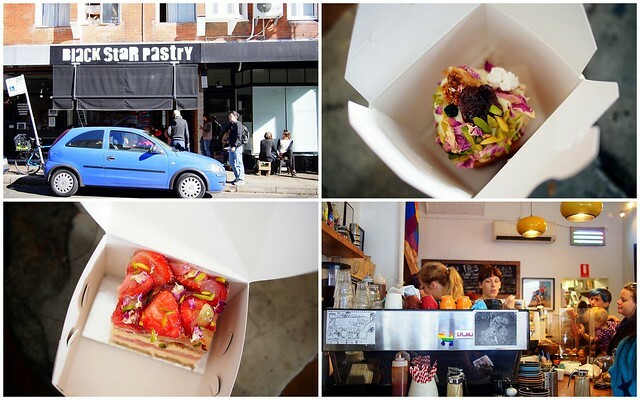 When in Sydney, if you have room for only ONE cake, please head over to Black Star Pastry. The original and perpetually busy shop is tucked away in Newtown, right opposite Newtown Police Station. We had the Small Plum, Fig and Orange cake $4 and Strawberry, Rose and Watermelon cake $6. A less busy and more spacious outlet is located next to Kitchen By Mike. Sydney’s F&B scene is so vibrant and different. 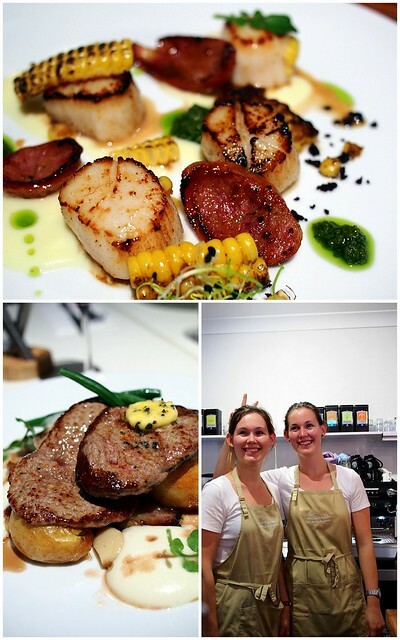 Kitchen by Mike is a cool concept restaurant where the menu is set daily based on what the team finds at the market. The food is served in a canteen style ranging from pizza, steaks, salads and sweets, and everything looked so fresh and delicious. 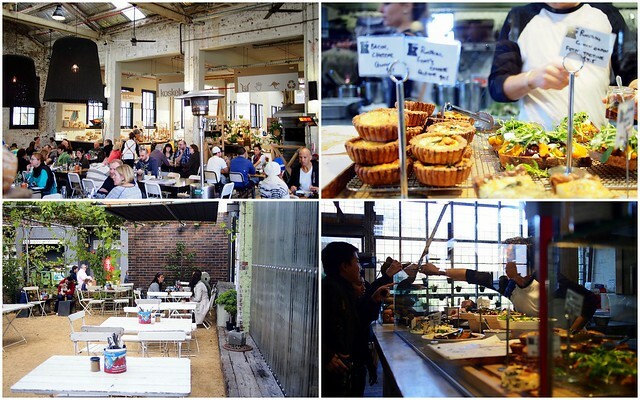 This warehouse-conversion restaurant houses a cafe and and also a furniture shop. Getting Here: Dunning Avenue runs parallel to Botany Road. 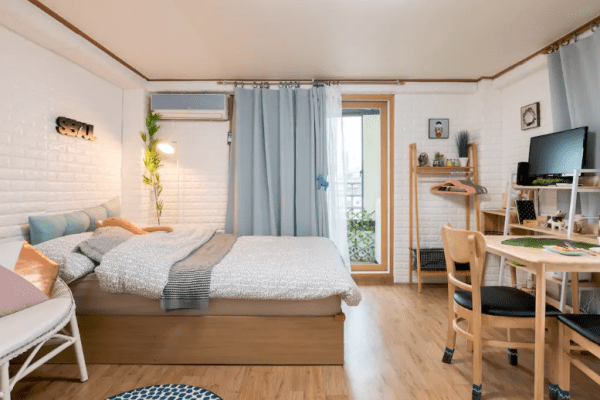 If coming from the city the 309, 310 or M20 will arrive just a two minute walk away from Kitchen by Mike on the corner of Botany Road and Hayes Road. If coming from the opposite direction please alight at the corner of Botany Road and Shirley Street. Alternatively it is a 15 minute walk away from Green Square train station. Now it’s time for some super, mega, thrilladelic action! 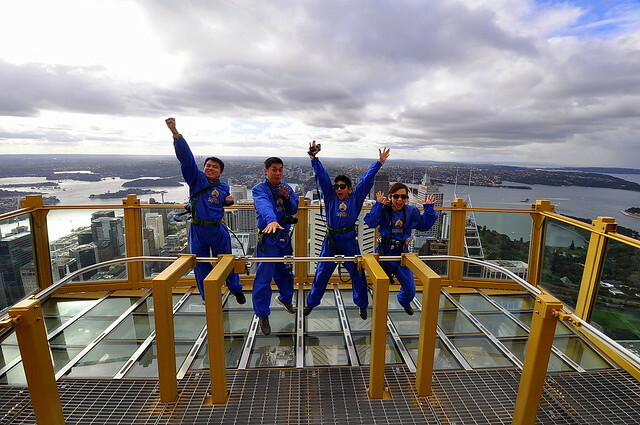 We went 268 metres above the street and the highest point above Sydney for the most breathtaking 360-degree views in town.The Skywalk experience was amazing! We were walking on those the glass-floor viewing platform between us and the city below. I was afraid of heights but this experience was truly amazing. Knowing that I’m in safe hand, I was able to let loose and enjoyed myself. Getting Here: Sydney Tower Eye and SKYWALK is located in the new Westfield Shopping Centre, at the corner of Pitt Street and Market Street in the heart of Sydney’s retail precinct. Head up to Level 5 and follow the signs from the food court. 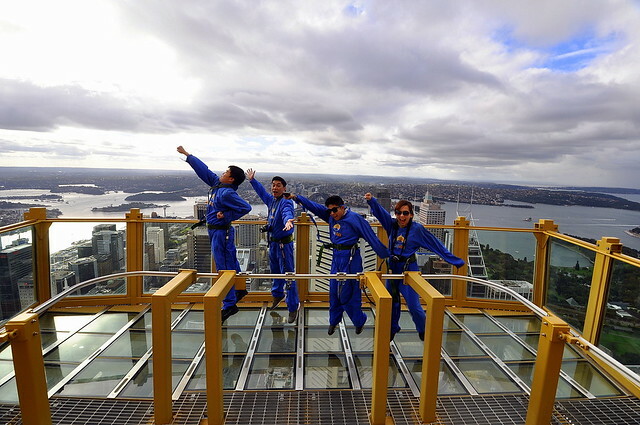 Here we were, rewarding ourselves with a stunning, panoramic view of the city skyline, Sydney Opera House or Sydney Harbour Bridge after the SKYWALK experience. Sydney Harbour Bridge is the world’s largest steel arch bridge and the widest long-span bridge in the world. You cannot visit Sydney without seeing this magnificent structure in person. The Sydney Opera House is truly a masterpiece of modern architecture. 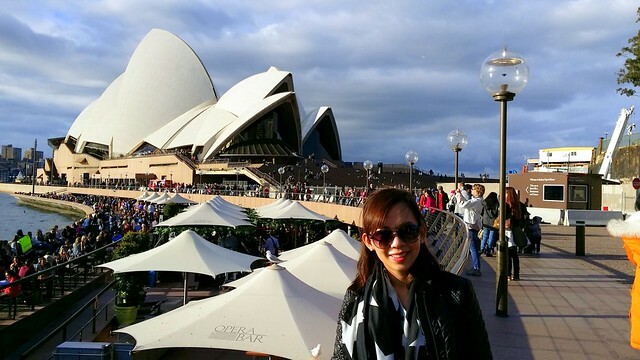 The Sydney Opera House guided walking tour is highly recommended. 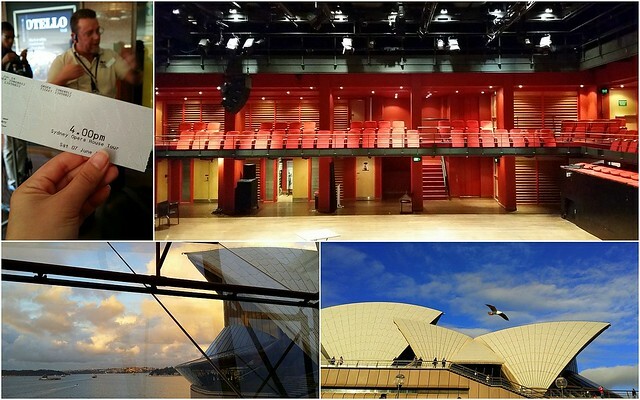 We felt really excited to go behind the scenes at the World Heritage listed Sydney Opera House. During our one-hour guided walking tour of the Sydney Opera House, we learnt so much about the controversial story of the building’s construction and was shocked that it might never have been built at all. There were also a lot of fun facts and quirky facts about this magnificent architecture. 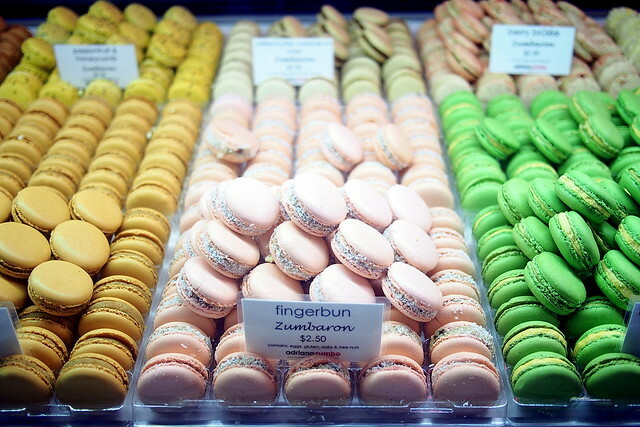 If you are a macaron lover, do not miss out Zumbarons of Adriano Zumbo fame as he is one of Australia’s most celebrated patissiers. I bought a box of 6 macarons and the salted butter popcorn flavour is definitely the boom! 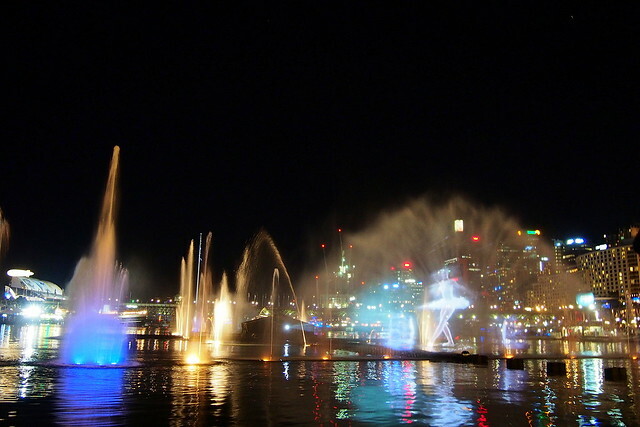 From The Star, we took a short stroll to Darling Harbour for the Vivid Aquatique Water Theatre. The Vivid Aquatique Show was spectacular! My favorite was this light show that feature a ballet dancer and swans from Swan Lake. It is projected onto spraying water by the Vivid Aquatique Water Theatre. The show was every hour on the hour from 6pm – 11pm nightly with an extra show on Saturdays at 8.30pm. Dinner was at The Malaya with great view overlooking the Darling Harbour. 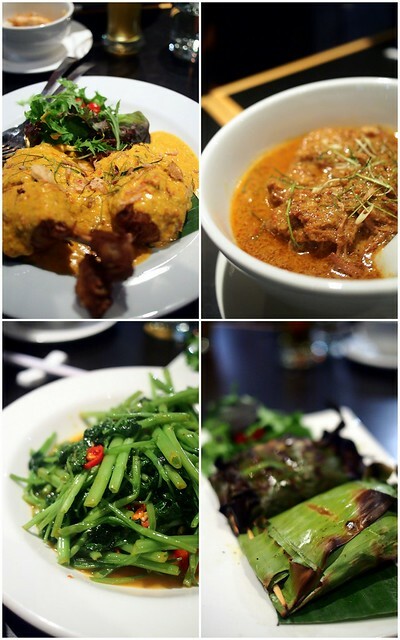 The menu features mainly delicious South East Asian cuisine developed by Head Chef Mustapa Jaffar. We had a few dishes, the otak-otak and beef rending really stood out! 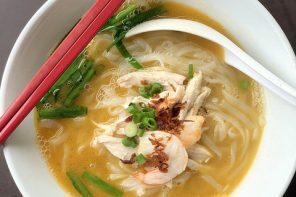 It is definitely authentic tasting Malaysian food for the home-sick. Wynyard Station – Alight at Wynyard Station, take the York Street exit, then walk down Erskine Street towards Darling Harbour (5 to 10 minute walk to King Street Wharf. Town Hall Station – Alight as Town Hall Station, walk north up George Street, turn left onto King Street. At the corner of King Street and Sussex Street you will find the King Street pedestrian bridge leading direct to Lime Street (10 to 15 minute walk to King Street Wharf. We could not get enough of Vivid Sydney, so after dinner we walked over the Martins Place. 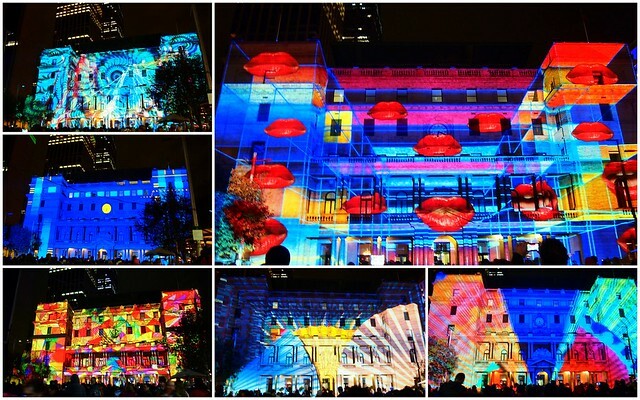 Seven spectacular light installations light up Martin Place for the very first time during this year’s Vivid Sydney. Day 4 is a sun, sea and beaches kind of day. 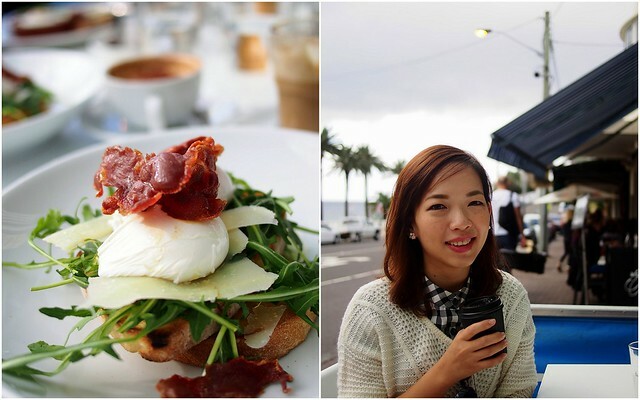 We started our day early at Swell Cafe that overlook the beautiful Bronte Beach. It serves breezy breakfasts, light and just-right lunches and fine dinners. My order of truffle poached egg was spectacular! We took the coastal walk from Bronte to Bondi. This is the most famous, most walked track in Sydney, and I can see why. Its combination of beaches, parks and spectacular views make this walk unique. It includes Bondi, Tamarama and Bronte beaches so we got to visit all three beaches at one go! 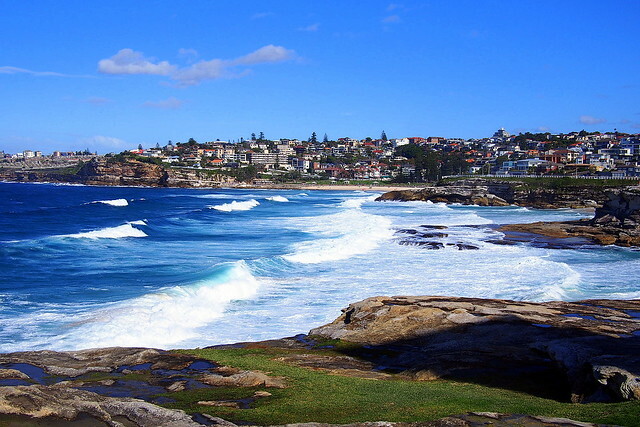 Bondi Beach with its glistening ocean and pristine sands is Sydney’s most famous beach. We were pretty excited as we were told that this is THE place to rub shoulders with popular Sydney stars who frequent here. 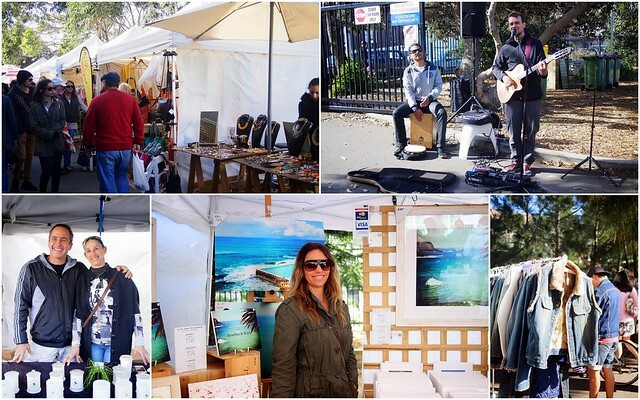 Every Sunday, the Bondi Sunday Market is seen with stalls selling emerging designers’ fashion, beachwear, accessories, bric-a-brac, retro furniture, artworks and crafts by local artisans. It is located in the grounds of the local public school on Campbell Parade. I had fun talking to the vendors and running through some of the funky stuff here. I even bought myself some home made candles from this lovely old couple. 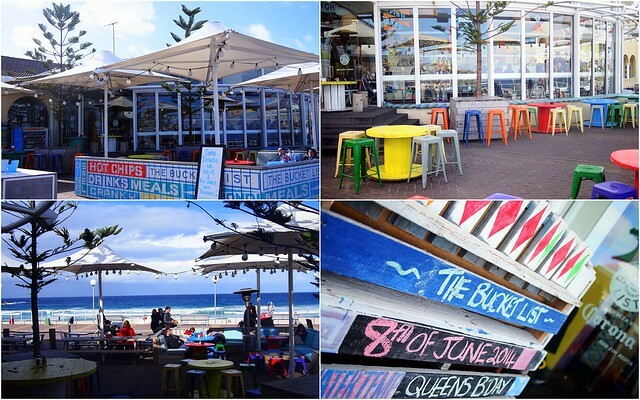 With panoramic views of Bondi Beach and a relax atmosphere, this place is a great Bondi beach spot. 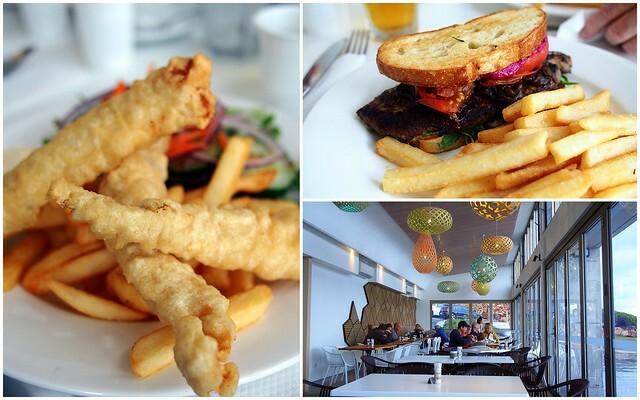 Remember to try their selection of cold beer and their signature fish n chips in a bucket! 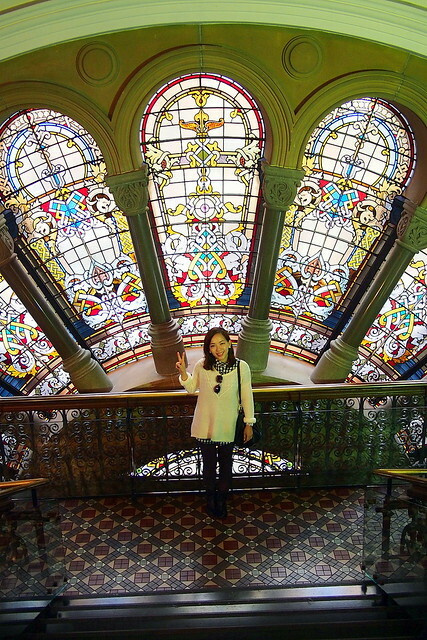 Its (window) shopping time at the Queen Victoria Bulding! 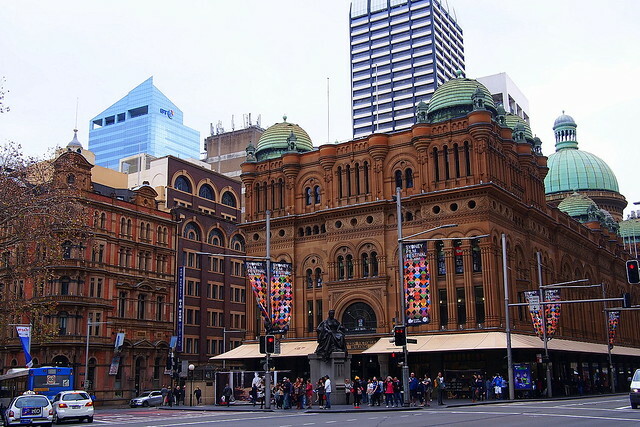 It is also well known as the most beautiful shopping centre in Australia; with its eleborated carvings, stained glass windows, wrought-iron balustrades and patterned floor tiles. Remember to look out for the letter from Queen Elizabeth II to the citizens of Sydney here. It is to be opened in year 2085. If you are feeling indulgent, why not have afternoon tea at the Palace Tea Room? 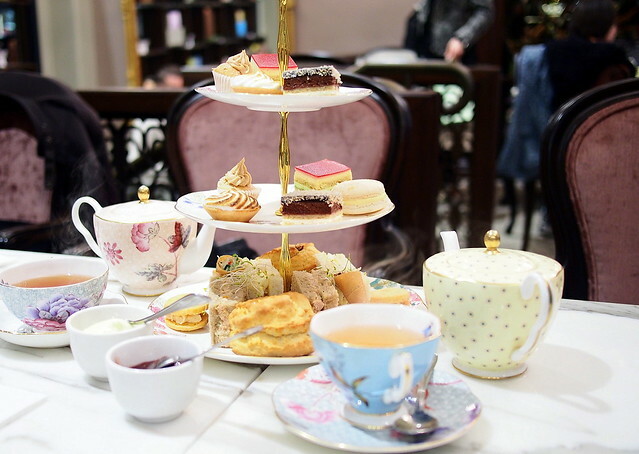 Guests can chose from a selection of 29 speciality teas and a menu of delectable and ever-so-frivolous foodie delights; delicate sandwich fingers, an array of irresistible cakes, enticing petit pastries, sumptuous scones and lots more. 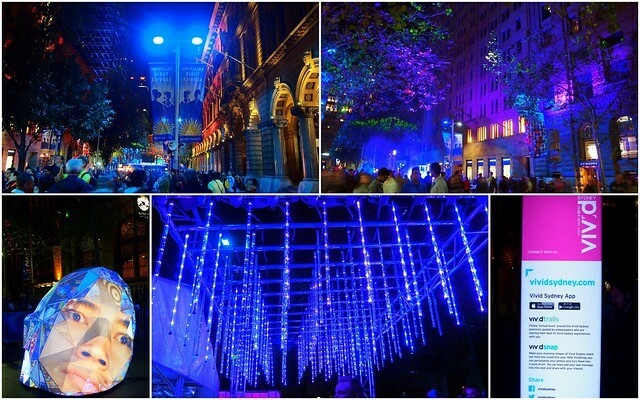 Our Vivid Light Walk started shortly after we left QVB. We enjoyed walking through the different displays and light installations. 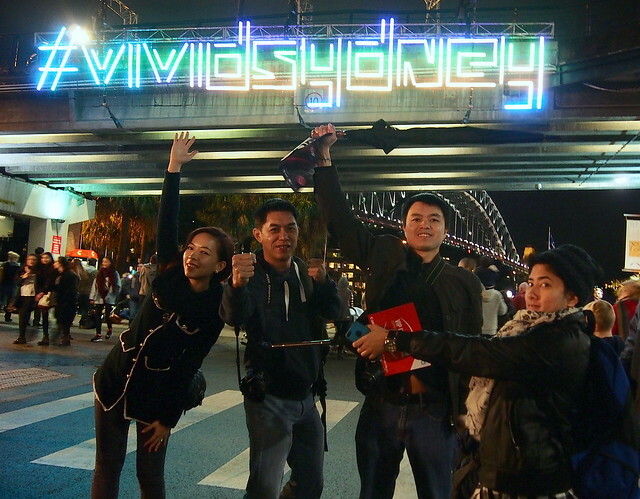 This year, Vivid Sydney’s famous Light Walk extends beyond the harbour foreshore and onto the harbour itself. 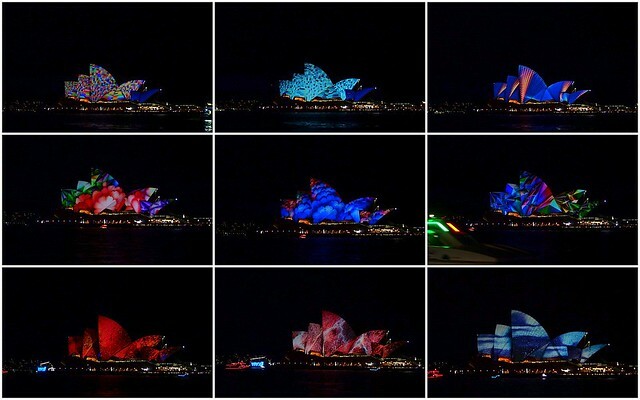 The Vivid Live music festival also gave the Sydney Opera House a digital makeover. 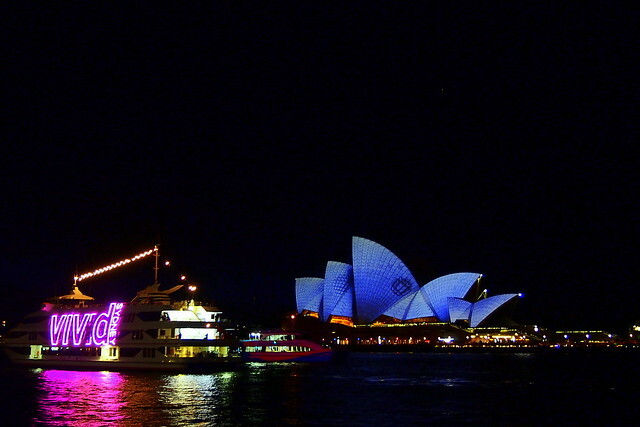 Theme “Lighting of the Sails”, The Opera House’s sails become a canvas of digital images, projecting images include dancing colors and transforming shapes. 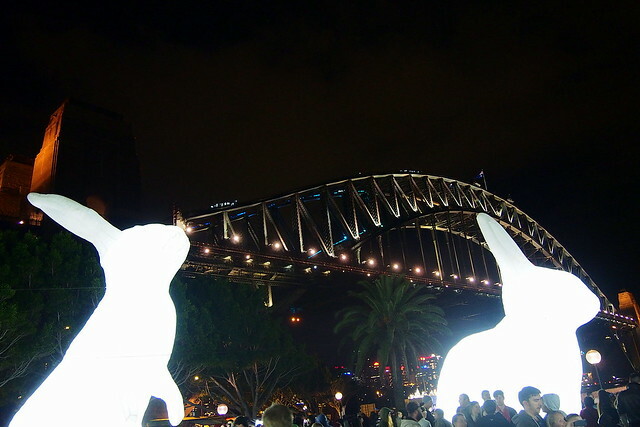 These giant illuminated rabbit sculptures installation was also very popular amongst the locals and the tourists. Kids and young adults were having fun by taking part in the interactive illuminated art installations in Custom House. The building’s projection of image and music will change according to their dance move. Waterfront Restaurant has contemporary nautical decor and breathtaking views across Sydney Harbour to the Opera House and Harbour Bridge. We had some amazing seafood platters and great NSW wines here. Towards the last day of our trip, we had the best breakfast ever at Devon Cafe. Headed by two Malaysian entrepreneurs, this cafe won the Sydney Morning Herald’s Good Cafe Guide’s “Food Cafe of the Year” award for 2014. They seems to be experimenting and updating their menu seasonally. 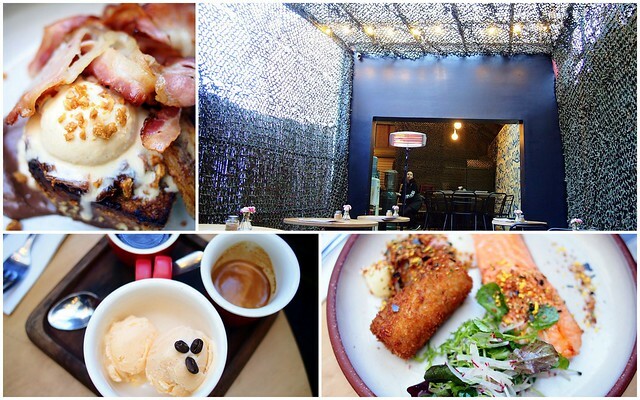 Remember to visit this cosy and quirky cafe when you are in Surry Hills. 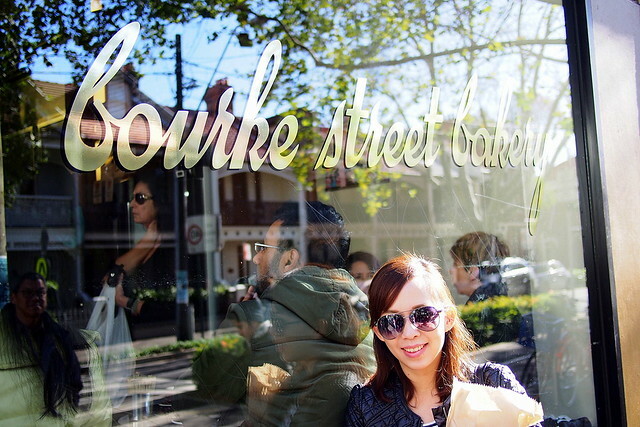 Opened in 2004 by baker/chefs Paul Allam and David McGuinness, Bourke Street Bakery is a Sydney institution. It is so tiny but so busy, thanks to its mouth-wateringly good baked treats. We even bought back from artisanal sourdough bread back to Malaysia from here! 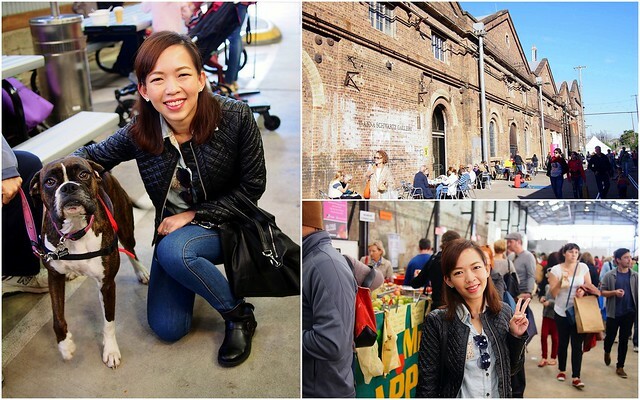 With its bulging bookshops, coffee stops, quirky shops and vintage stores, Newtown is Sydney’s most vibrant and eclectic entertainment and shopping precinct. Newtown’s vintage clothing and retro furniture scene began when vintage was still called second hand. 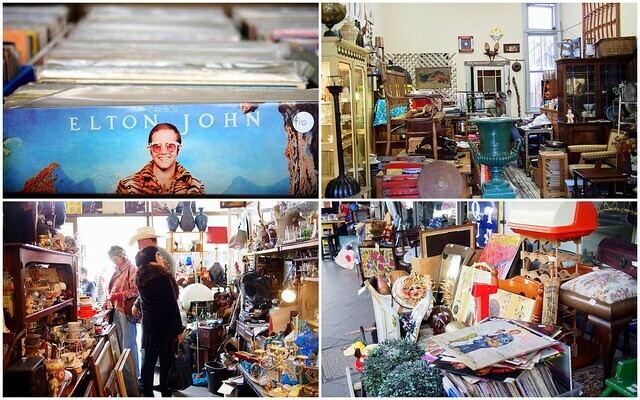 We had fun exploring the King Street which is bursting with vintage clothing and collector furniture pieces. 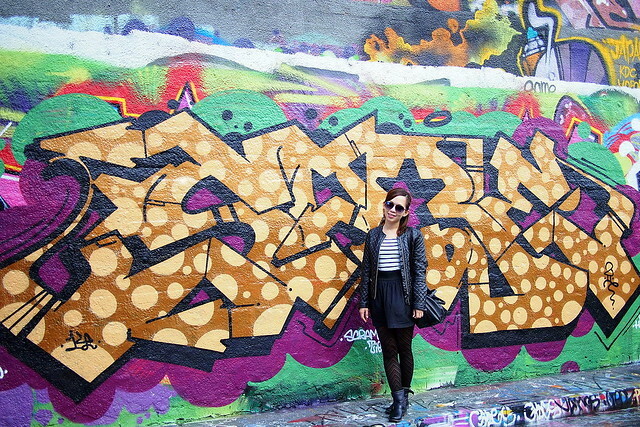 We also took a look at some amazing street art and graffiti in Sydney’s Newtown. The Animal, is by far the coolest and the most grungy looking (in a good way) restaurant that I’ve ever been to. This pub style restaurant is a great place to take a lot of photos and to mingle with the locals . 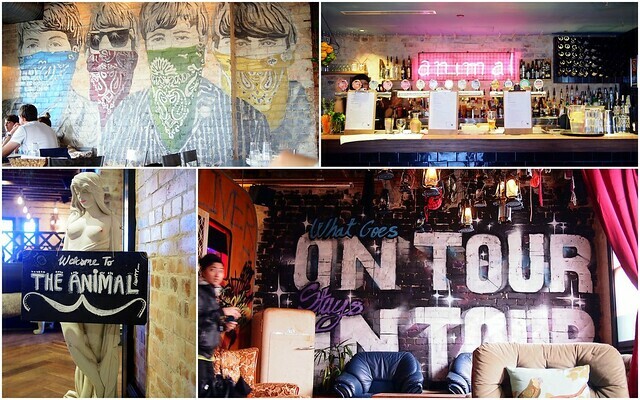 We loved its beers on tap and their rock inspired menu which features a lot of meat! Remember go grab your Urban Walkabout Maps from most hotels in Sydney, at the Rocks or Darling Harbour Visitor Centres or at most featured stores in each area. 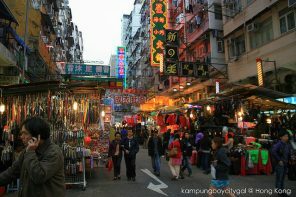 There are different guides for the CBD area, Bondi, Surry Hills, Newtown, The Rocks, China Town, etc. The Sydney Fish Market is a must for seafood lover like me. 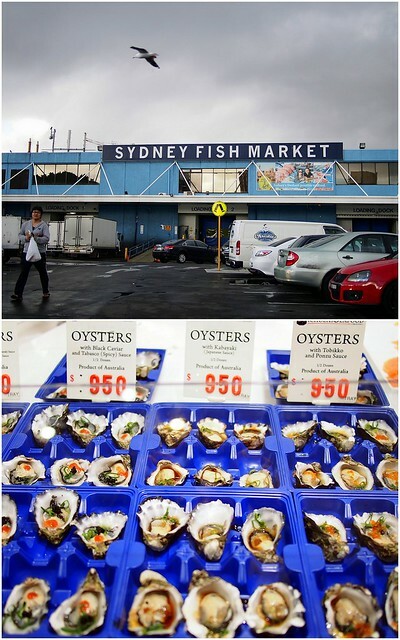 Where else can you get a dozen freshly shucked Sydney Rock Oysters for around $10? Sydney Fish Market (SFM) located at Bank Street Pyrmont, is open every morning (except Christmas Day) from 7.00am. Getting Here: Light Rail Fish Market stop which is located across the road from the Market, bus 501 and 443. 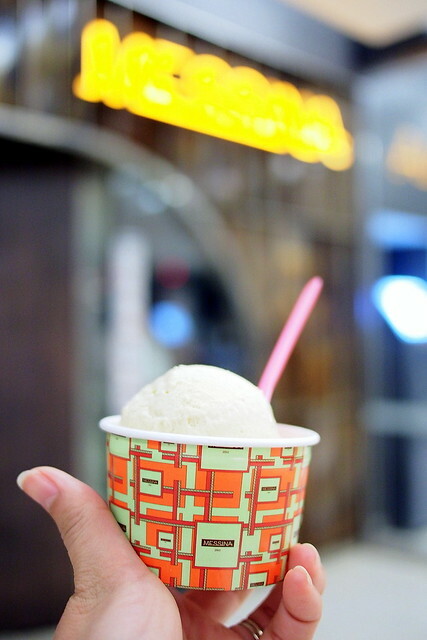 Just like the zumbarons, Gelato Messina is a must when it comes to dessert. I just had to grab a scoop of their famous salted caramel with white chocolate chip flavour before heading to the airport! Getting Here: catch the Light Rail from Central Station to The Star with access to the Sydney Lyric Theatre via a lift. 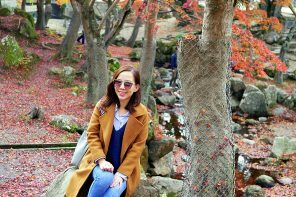 I hope you enjoy reading our travel stories. If you ever have a question or need help in planning a trip to Sydney, feel free to shoot us an email. For more updates, remember to Like us on Facebook or Follow us on Instagram!